Many people eat black-eyed peas on New Year’s Day for good luck in the coming year. You can eat them however you want, but I love them in this great appetizer dip. It’s a fresh spicy salsa that’s hard to resist! 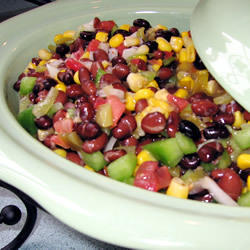 With chopped onions, beans, corn, tomatoes, jalapeno peppers, and green peppers, there is plenty of flavor to scoop up with tortilla chips. You could even add some crumbled cooked bacon on top for a little extra kick. That sounds lucky to me! Most of the ingredients come from a can so you can throw this together quickly. Several reviewers preferred using fresh tomatoes, but using Mexican-style canned stewed tomatoes works for me. If anything should be fresh I’d vote for a fresh jalapeno pepper instead of canned. You can also add cilantro if you like. Be sure to make this at least 8 or 9 hours ahead of time to let the flavors meld. Cover and keep in the fridge until you are ready to serve. Click here to link to AllRecipes for this easy recipe. By the way, the beans and peas combined with the corn and corn chips makes a complete protein. So you could eat this as a meal if you make enough. Make it the day before for a super easy meal that is super healthy. Jenny, I am definitely making this for New Year’s Eve to eat at the stroke of midnight. We could all use a little good luck in 2012! I hope you make it soon. Enjoy! My aunt makes something like this and it is so good! If we have this at a family event it ends up being the only thing I end up eating because it’s soooo good!!!! Thanks for sharing, I need to make this again!